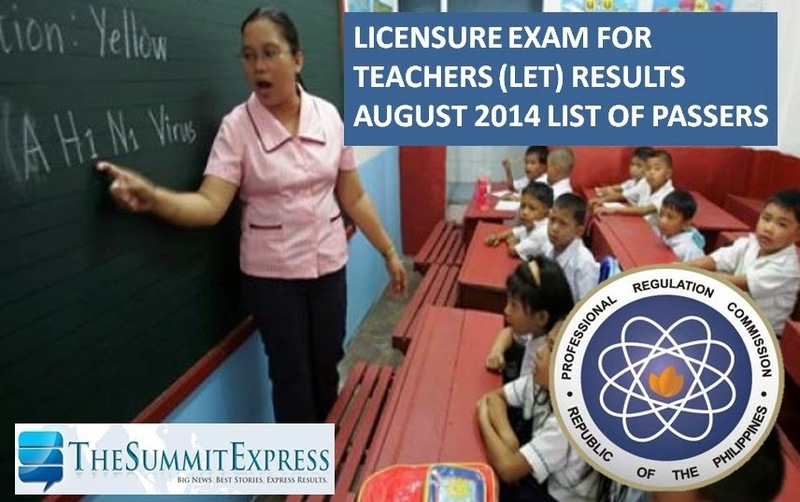 Those awaiting results of August 17, 2014 LET (Licensure Examination for Teachers) or known as Teachers Board Exam may find here complete list of passers, top 10 (topnotchers), top performing schools and performance of schools as the Professional Regulation Commission (PRC) and Board for Professional Teachers (BPT) released official results on Monday, October 27, 2014. It is further announced that of the 25,301 elementary teacher passers, 21,649 are first timers and 3,652 are repeaters. For the secondary teachers, 23,820 passers are first timers and 2,947 are repeaters. LET was given by BPT in the following test locations: NCR- Manila, Baguio, Cagayan de Oro, Cebu, Davao, Iloilo, Palawan, Laoag, Legazpi, Lucena, Pagadian, Rosales, Tacloban, Zamboanga, Bacolod, Catanduanes, Masbate City, Catarman, Batanes, Jolo, Sulu, Bongao, Tawi-tawi, Romblon, Puerto Princesa, Palawan, Occidental Mindoro, and Hong Kong. PRC and BPT rescheduled Board Licensure Examination for Professional Teachers (BLEPT) to August 17 from July 27, 2014 to give way to the centennial anniversary celebration of the Iglesia ni Cristo (INC). PRC said that in order to hurdle August 2014 LET, an examinee must get an average rating of not less than 75% and must have no rating lower than 50% in any of the tests. Based from the statement of PRC Baguio Director Teofilo Gaius M. Sison Jr., the probable release date of August 2014 LET results is between October 20 and on the last week of October 2014 or the 41-50 working days after the examinations. The projection excludes holidays on August 21 (Ninoy Aquino Day), National Heroes Day (August 25) and non-working days (Saturdays and Sundays). Disclaimer: This is only an assumption of TheSummitExpress. Usually, readers of this website and our partner exam results website PRCBoardNews.com can get information of the exact release date few days or hours before the judgement day. August 25, 2014 Update: The Professional Regulation Commission (PRC) Baguio Regional Office said that exam results will be released after 20 working days. More details here. September 13, 2014 Update: PRC updates IT Systems for August 2014 LET results? September 22, 2014 Update: PRC Regional Director Teofilo Gaius M. Sison, Jr. said the exam results will be released by end of October 2014. More details here. October 20, 2014 Update: LET Results are out soon. Check out this page more often for the updates. October 27, 2014 Update: Results are finally out online! In January 2014, none of the schools qualified for the top performing rank for elementary level. For secondary level, Saint Louis University (SLU) and University of Santo Tomas got the highest passing percentage of 93.80 and 89.29% respectively.